'Dr. Dale Barnard: Working With SARS' by David Sidwell - DPC Prints! This is Dr. Dale Barnard in the SARS lab. As you can guess, he has to get all gussied up to work with it! The lab is quite safe, with lots of precautions. 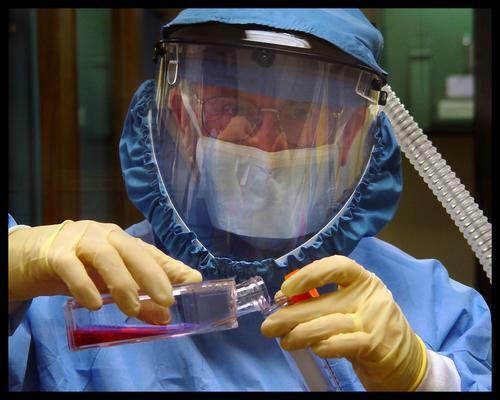 The SARS virus itself is in a very thick liquid, preventing it from becoming airborne. This image is cropped differently than the original challenge photo, and the colors are a bit more natural, too. This photograph originally appeared in the At Work Challenge.